I’ve been taking a break from Bach for the past week, listening to some modern stuff recommended by various blogs and lists on eMusic. It’s quite a change from baroque music, and requires a whole different manner of interpretation and listening. Pieces include Karlitz Stockhausen’s Gruppen (DG), some flute concertos by Kalevi Aho, Haukur Tómasson and Christian Lindberg (BIS / eMusic), Symphonies 1 and 4 by Jean Sibelius (really more romantic than modern, I guess) (BIS / eMusic), Turangalîla-Symphonie by Oliver Messiaen (Naxos / eMusic) and James MacMillan’s Triduum (BIS / eMusic). I don’t have much to say about them, really, since I don’t feel like I completely understood what I was listening to. The Sibelius symphonies are fantastic, and I certainly enjoyed parts of the others, but in all the music I was struck by how disjointed they all seemed. Part of my problem, at least with Messiaen’s symphony is that the work has a very carefully designed structure with three themes (statue, flower, love) and ten movements connected by these themes, but as much as I tried, I couldn’t easily pick up these themes, and so I didn’t see the pattern. The Wikipedia entry even includes some music notation to help an educated reader pick up the melody of the themes, but I no longer remember how to read music. I think this is sort of like reading Thomas Pynchon. If you don’t pay attention and read carefully, the whole thing will seem completely incoherent. But if you look up the references, write down the characters, and really study what’s going on, his books are masterful in ways that most other writers don’t approach. My problem with musical analogues to this kind of brilliance is that I’m a much more accomplished reader than musical listener. I lack the basic tools to even know what I should be listening for. But as Pynchon (and Joyce before him) have demonstrated to me, it’s worth the effort when you’re ready. I’ll be revisiting these works again. Bach’s greatest achievement is the Cantata Project, the five annual cycles which he began when he came to Leipzig and finished five years later. Because of losses in manuscripts and only the barest suggestion of the overriding design, we are probably doomed to see this monument as a series of individual works rather than a mighty collection of 300 parts with hundreds of movements. I’m starting my cantata listening with the three works written for the first week in Advent, which was last Sunday, and happens to be the beginning of the church year. I doubt if I’ll be able to listen to all of Bach’s cantatas in order, but I’ve listed the upcoming dates for all the cantatas, the place of all of Bach’s works on the Bach Edition CDs, as well as my progress listening to them on this page. Here, I’m listening to cantata 61 from CD III-1, cantata 62 from III-28, and cantata 36 from IV-5. They’re all conducted by Pieter Jan Leusink and the Netherlands Bach Collegium with the Holland Boys Choir. Soloists include Ruth Holton (soprano), Sytse Buwalda (alto), Nico van der Meel (tenor) and Bas Ramselaar (bass). In reading reviews of Leusink’s complete cycle, many commentators seem to specifically dislike Buwalda, and complain that Leusink’s interpretations aren’t very considered. Leusink recorded the entire set of Bach’s cantatas in a single year, and the reviews usually mention this as a possible reason for why his cycle isn’t as polished and “correct” as other cycles. I haven’t been listening to cantatas long enough to really know if these complaints are valid or not. I also downloaded Philippe Herreweghe’s Adventskantaten CD from eMusic. It’s got the same three cantatas on it, and Herreweghe’s cantata recordings are highly regarded by the same people who aren’t all that fond of Leusink, so it should be a good comparison. I’m using several references to guide my listening. First, and foremost is the Bach Cantatas website. They’ve got commentary culled from the mailing list of the same name for all the cantatas and many of Bach’s other works. For a mailing list, there’s an amazing diversity of very expert opinion on all aspects of Bach’s music. Second is Simon Crouch’s Listening Guide to Bach’s Cantatas, which provides a short summary of all the cantatas and his opinions on them. Finally, I borrowed a copy of W. Gillies Whittaker’s two volume The Cantatas of Johann Sebastian Bach from the library. It’s out of print, but is available from used booksellers for a reasonable price. It’s a pretty detailed look at each cantata, but it suffers a bit because it doesn’t reflect recent scholarship regarding Bach. Alfred Dürr’s The Cantatas of J.S. Bach is apparently the best source of contemporary information, and it includes parallel German / English translations for all the cantatas, but none of the local libraries have a copy, and a new paperback is more than $70 from amazon.com. Sight unseen, that’s an awfully expensive book, but if I really get into the cantatas, maybe it’ll be worth it. I’ve listened to these three cantatas more than 30 times in the last week and a half, so it’s time to write about them and move on to something else. This cantata was first performed December 2, 1714 in Weimar. 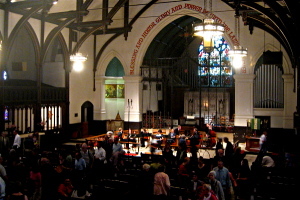 Bach held the title of concertmeister at the time, and was formally required to compose new church music once a month. This cantata is also known to have been performed November 28, 1723 in Leipzig . The first movement starts with a great chorus, with violins and other stringed instruments playing the melody from Martin Luther’s hymn, which names the piece. It’s a great introduction to the work, and for me, to the cantata form. Next is a recitative sung by the tenor backed by a violin and organ, followed by an aria that’s also sung by the tenor. According to the Wikipedia, the difference between a recitative and an aria is how speech-like the rhythm of the vocal accompaniment is, and I guess in that context the tenor is really singing the third movement in time with the melody, rather than speaking over it as he does in the second movement. It’s cool to have one follow the other with the same singer so I can hear the difference between them. The fourth movement is another recitative, but this time the strings are plucked (pizzicato). The passage being sung comes from Revelations 3:20: “Here I am! I stand at the door and knock.” and the plucked strings is meant to evoke the sound of Jesus knocking. It sounds a bit like a foolish compositional trick, but it really does work, especially at the point in the music. I’ve always disliked Aaron Copland’s Appalachian Spring because of the clopping sounds meant to evoke the sound of horses, but I don’t mind Bach’s use of pizzicato here. The work concludes with a beautiful soprano aria and an absolutely fantastic chorale. I like the last movement best; it’s really joyful. Unfortunately, it’s also really short, and to me, seems to end the cantata prematurely. As far as the two different recordings I have (Leusink and Herreweghe), the timing differs between the two works, but the instrumentation, singing and expressiveness of the piece are very similar between the two. I really can’t complain about either, and I don’t know if I would even be able to recommend one over the other. This surprises me a little bit because most of the commentary I’ve read about Leusink and the singers have placed his versions near the bottom of the available choices. Not so in my ears! Cantata 62 was first performed on December 3, 1724 in Leipzig as part of Bach’s second annual cycle of cantatas. He wrote five complete cycles during his first years as capellmeister at the St. Thomas School (an incredible output given all the performances, practice and other labors he was required to do in addition to essentially composing a new work each week), but unfortunately most of the last two cycles have been lost. This cantata is based on the same hymn as 61 and has a similar structure of a chorus, an alternating series of arias and recitatives, and a final chorus. Compared to 61, I like the opening chorus even more because it seems like the instrumental part has more of a chance to develop before the chorus comes in, making it that much more dramatic. There’s also a lot of counterpoint among the singers that I like. Next we’ve got a tenor aria, bass recitative, and bass aria. Only the bass aria is interesting because of the strong instrumentation. For this movement, I do prefer Herreweghe’s version over Leusink because it’s very forcefully played and sung. Leusink seems to drag it out and it loses a lot of it’s power. The final recitative before the closing chorus is a duet for the soprano and alto singers, which makes it different from the movements thus far. The chorus for this cantata is even shorter than the chorus of cantata 61, but it’s also not as good. The best part of this cantata is the opening chorus, by a long shot. I like Herreweghe’s version quite a bit more for this cantata, mostly due to the quickened pacing which makes it brighter and more urgent sounding. The opening chorus and the bass aria really benefit from the faster timing. This sacred version of cantata 36 comes from Bach’s reworking of several secular cantatas (versions 36b and 36c still exist) and was first performed December 2, 1731. Here we have a completely different pattern, with an opening chorus, followed by alternating chorales and arias. Like the other Advent cantatas (maybe cantatas in general?) it ends with a chorale. There are no recitatives here, which is apparently unusual, but for me is a welcome change. The opening chorus has a lot of the counterpoint I like from the opening of cantata 61, but here the instrumentation features woodwinds (Oboe d’amore) rather than strings carrying the melody. The rest of the cantata carries along similarly to the chorus, with a variety of duets, arias and chorales and more woodwind accompaniment. The melody is very simple and is easy to pick out throughout the work. I like the soprano aria in the seventh movement not so much because of the singing, but because the voice and the featured violin (violone?) complement each other very well. Similar to cantata 62, Leusink is slower and more leisurely than Herreweghe. That works well for the soprano aria, but not so well for the opening chorus. I also like Leusink’s soprano (Ruth Horton) more than Sibylla Rubens. Horton sings more gracefully and emotionally, while Rubens really belts it out like an opera singer. I think the aria needs a lighter touch. Anyway, it’s a mixed bag here and I can’t outright recommend one version over the other. And in general, I don’t think you can go wrong with either recording. The music is too good. 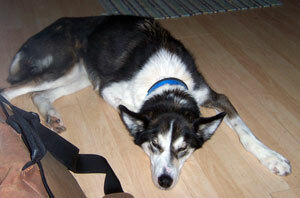 Deuce was our first sled dog. I was supposed to get a different, older sled dog upon his retirement, but we found out that one liked to try to eat small animals and we had three cats at the time. My friend asked if I could choose any of her other dogs, which would I want? I had planned on making Deuce my “project” dog for the winter of 2001-2002, so I said him. He was only about four years old at the time. The thing about Deuce is that he has a few screws loose — mentally, that is. One minute he's sweet and rubbing his face up against you for pets. The next minute he's backing away from you and woofing like he doesn't know who you are. He's still not 100 percent comfortable with Chris. Heck, he even has his moments with me! When he wants to be, Deuce is a fabulous sled dog; he has a lovely, smooth gait and knows gee/haw better than many lead dogs. But he doesn't want to be a lead dog; at least not always. He'll do it on occasion, but one never knows when or if he'll just stop leading and try to sit down (which he never does when in the team). And he doesn't always want to be a good sled dog so sometimes he dips snow or doesn't pull, although he never completely quits. When we got Deuce, the plan was to let him be a house dog like our pet dog, Nika. Turns out he didn't want to be a house dog. We were eventually able to convince him to come inside for meals (most of the time), but that was about it. He'd occasionally come inside at other times, but would just wander around and sniff things; he'd never relax and hang out. Some times he'd seem like he wanted to be in the house, but he'd still just walk around. We figured that it was his choice and we'd let him decide when or if he wanted to be a house dog. The years went by and we got more sled dogs. 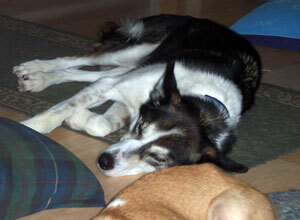 Next came Piper, who took to being a house dog like she'd done it all her life. Buddy, Kiva, and Koidern are all semi-house dogs — they get to be inside when we're home and awake, but sleep outside and are out if we're not at home or can't be watching them. We thought that maybe Deuce would take a lesson from the other dogs and learn to be in the house. Alas, Deuce still preferred to be outside. 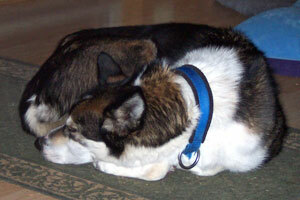 That is, until the evening of 6 December 2007, approximately six years after he came to live with us. Then, out of the blue, this happened: We were so shocked that I took pictures to prove it to ourselves (and others!). After six years to have Deuce finally lay down in the house! I couldn't help but wonder: was this a fluke? A one time event? Did a loose screw in his head temporarily shift? That was yesterday, 8 December. This one too. He actually looks comfortable and relaxed! He's been laying down again today. So maybe it's not a tiny bit of oil burning for eight days, and we don't live on 34th Street, but it's our little holiday miracle anyway. Along with listening to all of Bach’s extant music via the Bach Edition I wanted to learn more about the man, and hopefully understand the music a little bit better. Johann Sebastian Bach was born in 1685 to a musical family in Eisenach. By the time he was eighteen he was a respected organologist and received appointments as church organist first in Arnstadt (in 1703) and then in Mühlhausen (1707). In 1708 he was appointed organist and chamber musician in Weimar, and later became concertmaster there. His next position was in Cöthen from 1717 to 1723 where he served as capellmeister. His final position was as cantor at St. Thomas School in Leipzig where he remained until his death in 1750. Along the way he was married twice (his first wife died in 1720) and had twenty children, ten of whom survived into adulthood. Christoph Wolff’s biography is a very good scholarly introduction to what we know about Johann Sebastian Bach. Wolff is a well respected Bach expert, directing the Bach-Archiv in Leipzig and author and editor of many other Bach publications. This expertise really comes through in the book, which is filled with scholarly discussion and excerpts from what little remains from Bach’s life. Because most of Bach’s letters, writings and music are gone, a biography of Bach is more like a series of reasoned hypotheses that can never be fully rejected. Wolff does an excellent job leading us through these arguments. Bach’s biography suffers from a serious lack of information on details, many of them crucial… Indeed, it would not be difficult to devote entire chapters to what it not known about Bach’s life. Thus, conjectures and assumptions are unavoidable, and this book necessarily calls for numerous occurrences of “probably,” “perhaps,” “maybe,” and the like. Yet, as I try to demonstrate in these pages, it is not impossible to reveal, even in the case of Bach, the essence of a life. He goes on to say that what we do know about him comes to us in the form of his music, music which Bach used to explore the boundaries of what was known about musical science at that time. 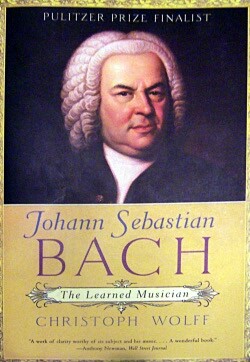 Although I lack the musical training to understand what was so revolutionary about Bach’s explorations (for example, writing about The Well-Tempered Clavier, Wolff writes “In demonstrating that the tonal system could be expanded to twenty-four keys not just theoretically but practically, Bach set a milestone in the history of music whose overall implications for chromatic harmony would take another century to be fully realized.”), Wolff’s analyses of Bach’s music in the book only increases my appreciation for Bach’s music. 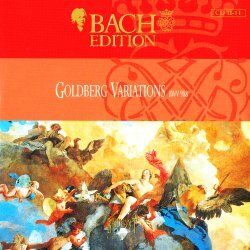 Next up in my listening of the Complete Bach Edition set of CDs is The Goldberg Variations. At the same time I listened to this CD, I also listened to a new interpretation by Simone Dinnerstein, played on a 1903 Hamburg Steinway concert grand instead of the harpsichord version (played by Pieter-Jan Belder) from the Bach Edition CD. Listening to the two versions side by side was really helpful in identifying the differences between the variations, and the juxtaposition of harpsichord and piano makes the whole exercise very enjoyable. Bach’s first biographer, Johann Nicolaus Forkel (1802) claimed that the Goldberg Variations were commissioned by Count Hermann Carl von Keyserlingk, who had trouble sleeping. He told Bach “that he should like to have some clavier pieces for his house harpsichordist, Johann Gottlieb Goldberg, which should be of such a soft an somewhat lively character that he might be a little cheered up by them in his sleepless nights.” (quoting from Christoph Wolff’s biography of Bach). Unfortunately, at the time they were published in 1741 as the fourth part of Bach’s Clavier-Übung (keyboard practice), Goldberg was only 14 and probably couldn’t have played these difficult pieces. Also, the Variations weren’t dedicated to von Keyserlingk, as would have been required at the time if they’d actually been commissioned by him. 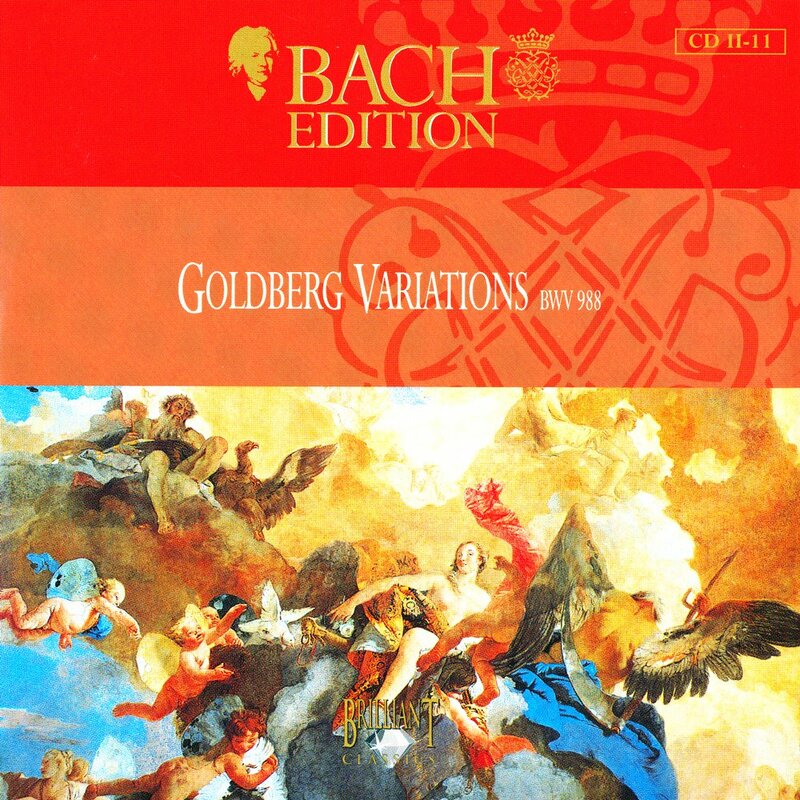 The Goldberg Variations begin and end with an aria, and in between there are 30 variations on the original. Every third variation is a canon (a work with a leading melody and an imitative follower that's offset in timing), and the tenth is a fugue (a sort of complex canon). According to the liner notes, the “bass and harmonic structure” are preserved in all the variations. I have a rudimentary sense of what that means, but when I listen to the pieces, I don’t really hear the similarities at all. I’d probably recognize them as being different from a solo keyboard work by Chopin, but that’s not the same thing as really understanding what’s going on. Luckily, musicologically (?) understanding it isn’t a requirement of enjoying it. I found Donald Satz’s 2000 discussion on the Bach Cantatas website of a series of Goldberg recordings to be very helpful in listening to the two versions I’m considering here, even though he doesn’t consider these recordings specifically. I include a few of his observations in the variation descriptions below. As mentioned, I listened to a version on harpsichord and a version on piano. I’d never really payed much attention to the sound of a harpsichord, but unlike a piano, the strings on a harpsichord are plucked by the mechanism, rather than being struck by a hammer. It results in a sharper sound, and to me, it’s easier to distinguish both individual notes and the different hands playing at the same time. I find it harder to distinguish the two hands with piano, but the sound is much smoother and expressive. The ability to carry emotion comes through in the piano version of the aria, played very slowly, luxuriously by Dinnerstein. The timing on the two versions aren’t all that different (5:03 for Belder, 5:39 for Dinnerstein), but Dinnerstein’s version really feels relaxed. The first variation charges out of the gate after the aria with lots of counterpoint and a nice fast rhythm. Hearing it on harpsichord, I immediately hear “baroque.” The harpsichord version also really emphasizes the different hands playing two contrasting melodies. Dinnerstein seems to be playing it even faster, and maintains the upbeat cheerful sound. The subtlety possible with the piano is also clear here, where she starts some of the melodic repeats quietly the first time through, and emphasises them the second time. The second variation also has a lot of contrasting melodies, but this time the two hands go farther away from each other, so the piece sounds more complex. It’s also quite short, over before you know it. Dinnerstein slows down quite a bit, and it sounds quite different as a result. Less about counterpoint and technical prowess, and more about atmosphere. Variation three sounds more full; both hands working very hard on their respective melodies. It really sounds quite challenging on harpsichord. On the piano, it’s still a complex piece, but I don’t get the sense that all the notes are coming together as chords. Again, this may be because Dinnerstein’s pacing is much slower (3:25 to Belder’s 2:01). The fourth variation is very rhythmic in both versions and the solid beat of the piece really carries you along. Thus far, this piece seems most similar between the two interpretations. The next variation is very fast and melodic with some great opportunities to allow subtle changes in timing to really enhance the music. I really like the way the measures (if that’s even the right word) end with a short melody, chord, and then a very short pause before continuing. Dinnerstein really flies through this one. Variation six has a different sound than what we’ve heard so far, and I think it’s because the melodies and bass line are lower than before. It’s not my favorite variation. Seven is happy, frivolous sounding music, maybe something you’d hear playing at a seventeenth century society ball, or a piece you’d play to entertain a baby. Dinnerstein plays it very slowly, making the little trills sound even more frivolous when she gets to them. The eighth variation is another rhythmic piece that reminds me of the fourth variation. But the longer, complex melodies in it make it sound like something other than a baroque piece, especially on piano. Variation nine is an emotional piece without a lot of melodic or counterpointal flourish. Belder plays it slow and sweet, giving it room to work. Dinnerstein plays it more quickly, but she varies the timing and loudness of the notes nicely, which really brings out the touching parts of the music. The tenth variation is a fugue with lots of voices and counterpoint, but despite all the things going on simultaneously, it lacks the little melodic touches and hooks that the other variations have. Dinnerstein and Belder’s versions are very similar; both seem to be just playing it straight up without any interpretation. The eleventh returns to form, and Bach seems to be emphasizing downward scales in this one. It seems like one hand is always working it’s way down a scale in this one. I don’t get much emotion out of it, beyond a sense of playfulness, even if it doesn’t reach the level of variation seven. I like Belder’s version here, mostly because I get a little distracted by the little trills when they’re played on the piano. Variation twelve doesn’t do much for me, especially in Belder’s hands. I like the brief melody that starts the piece and occurs a couple other times after lulls in the cacophony, but after that, it all sounds like a jumble of notes and I can’t really pick much out of the noise. Dinnerstein is better just because it sounds smother, but I have the same problem of not being able to really pull anything out of the sound the grab onto. The thirteenth starts off confused, just like the twelfth variation, and I admit that I really couldn’t make much out of this one. There are a few moments where a couple riffs on scales brought my interest back, but then lost it again. The fourteenth variation comes back to more of what I like in the other variations, melodies contrasting and combining together, with a lot of interesting changes throughout. It sounds like it’s a difficult one to play also, Belder makes a strange knocking noise about a quarter of the way in, as though he accidentally banged into some part of the harpsichord trying to play the piece. Some of the magic is lost in Dinnerstein’s performance because it sounds to me like she’s playing it so quickly that she doesn’t quite get all the notes to play fully. Maybe this is one advantage of the harpsichord’s plucking mechanism; each note will be heard, even if some of the variety is missing. Variation fifteen is a dark, sad sounding piece in a minor key (according to Satz, only 15, 21 and 25 are). It seems very slow after hearing number fourteen, but despite the pace and somber emotion, it’s very interesting. The two hands seem to play off each other more in timing than in tone, with one hand striking a note, pausing noticeably before the other hand answers with a single or series of notes. The last note, struck so late after the previous note is really poignant. Dinnerstein also uses the timing of the piece really effectively to enhance the emotion of the piece. Great stuff, even if (maybe because) it’s completely opposite from the bright, happy works that make up most of the Variations. Number sixteen sounds almost dance-like in that the piece seems to be playing up on it’s toes for the majority of the piece. Belder’s version is more than a minute longer than Dinnerstein but doesn’t sound slower, so I’m not sure where all the time goes. To me, variation seventeen sounds similar to eleven in that there’s a distinct emphasis on scales. This time around there’s more variation around the scales themselves, and they seem to go both up and down. Dinnerstein plays this piece really fast compared to Belder, and it sounds better this way than her interpretation of the eleventh. Both of these variations are really good, and what’s cool about these two is that they really show how interpretation is critical. They each do something completely different with the same piece, and get really good results for different reasons. Eighteen is a nice poetic and melodic piece that doesn’t depend on speed or overt complexity to keep the listener interested. Both interpretations are similar in speed and style, and both sound great. Satz describes variation nineteen as “feel-good” music, and I agree. It’s another one that has a nice sense of rhythm that carries you along with the melodies being played. Belder must be skipping a bunch of repeats in his version because it’s over in only 39 seconds. Just as I was getting into it, the thing was over. Dinnerstein takes almost two minutes for her version, which is much better. She’s varying the rhythm a bit more, and also effectively changes the feel throughout by managing how hard she’s striking the keys. Both Belder and Dinnerstein play variation twenty like it was a challenge to see how quickly they could fly over the keys, and Dinnerstein loses a lot of emotion by playing it this way. Both versions are invigorating and impressive, but I think they could have been more expressive. Variation twenty-one is another minor key variation, and it’s really poetic. Belder uses timing really well and effectively carries the emotion throughout. Dinnerstein plays it nice and slow, really picking up all the emotion. The way she slows and quiets down her playing on the first repeat at 1:10 is fantastic and contrasts nicely with the more forceful playing elsewhere in the variation. Her version is two minutes longer than Belder’s, giving her more range to explore. Twenty-two is a vibrant, upbeat piece for Belder; Dinnerstein plays it much more reflectively. I’m not sure which interpretation I like better, but this is another example of the great variety of interpretation possible in Bach’s music. Both versions make me smile: Belder uses dance-like rhythm and upbeat playing, while Dinnerstein lets the infectious melodic hooks carry me through her version. The next variation continues the upbeat theme, but is a lot more complex. Satz uses the word “rollercoaster,” which does fit the piece. I found Belder to be a bit disjointed and it didn’t seem to hang together as a unified work. Dinnerstein makes it sound more fluid, but I think there’s just too much going on here for me to be really satisfied. Variation twenty-four is a reflective work that’s neither upbeat nor sad, but has a nice relaxing pace and reduced complexity after 22 and 23. I got a little lost by the end of both versions, the variation turning into sound rather than music, and I think this probably means I’m getting tired. For me, listening to music of this complexity, especially twice for each variation, is a challenge to my ears and mind. Variation twenty-five has been called the “Black Pearl” because of how dark and depressing it is supposed to be. It’s the final variation in a minor key, and I agree with Satz that it’s the least effective of these three. Fifteen and twenty one were both emotional and dark. This one just seems to plod along in Belder’s version, never really getting anywhere or eliciting any feeling at all. Dinnerstein does a lot better for me, with nice pacing and expressive playing. Even so, I think it’s the least interesting of the three minor key pieces. The twenty-sixth variation is a very fluid, engaging work with one hand playing a reasonably simple melody while the other hand ranges all over the keyboard. Dinnersteing plays it incredibly fast but not firmly enough to really carry the entire melody. I appreciate the challenge, but it’s not a great interpretation of the music. She does build to more of a climax than Belder does, but I still liked his version better. Variation twenty-seven is more playful, melodic music. Belder goes from start to finish in just over a minute, making the work too short to appreciate. 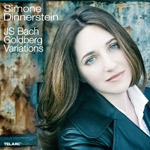 Dinnerstein takes twice as long, and I really like her version. Variation twenty-eight starts with one hand playing a light melody while the other plays non-stop trills. There are a few breaks where something else is going on, but the majority of the piece continues this way with one hand crazily dinging up and down while the other plays something simple. It’s not my favorite combination, and gets really repetitive by the end. Belder goes on for two minutes and 44 seconds before yielding. Dinnerstein’s version is a minute shorter, and she plays all the trills with a really light hand, bringing as much beauty out of the piece as might be possible. When her’s first started, I couldn’t believe how much more relaxing all the hammering sounded compared with Belder’s harpsichord. It’s still not my favorite, but it’s much easier to listen to. Twenty-nine is a toccata that covers a lot of ground. The variation means that it was difficult for me to concentrate on it because I never knew where it was going to go next, and there didn’t seem to be a unifying melody or rhythm that drew me from one part to the next. The final variation starts with a nice simple melody and accompaniment. These simple themes continue throughout, with a nice rhythm to keep it moving. It’s a graceful and relaxed way to end the variations. Both versions are similar in pacing and in the limited amount of flourish added around the edges of the work. 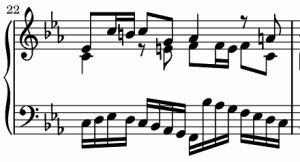 After the thirty variations, the initial aria is repeated. One of the eMusic reviews I read of the Goldberg Variations said that you wouldn’t hear the initial aria the same way at the end, after hearing all the variations. I’m afraid that even with careful listening, I wasn’t able to pick up on exactly how the Variations were actually related to the initial and concluding aria. As far as I can tell, I’m just hearing the aria again. It was really informative to listen to two versions side by side. Both versions were really well played, and I didn’t hear any huge mistakes either in technique or interpretation (although I’m far from an expert). I enjoyed the clarity of the harpsichord, and the light-hearted feeling it was able to give to the music, but often it made the Variations sound more technical and difficult, almost like an exercise. Also, Dinnerstein brought out more emotion and less of a feeling of it being a challenge to meet, and her slow pacing in a lot of the variations was a welcome change from Belder’s furious noise. But both versions had their good and bad parts, and I’d certainly recommend listening to more than one, especially if you can hear both harpsichord and piano.